There are so many ways to explore, create, and learn with preschoolers and toddlers. Most learning activities that we do are quick and easy to set up and allow for kids to participate in a variety of ways based on their interests and attention span. 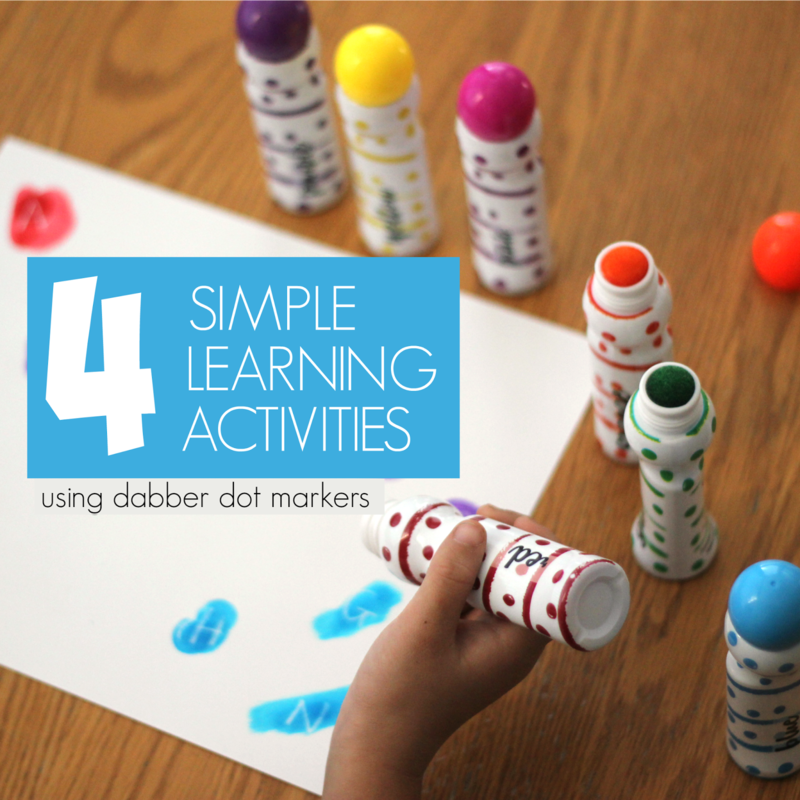 Today I have four simple learning activities to share with you using dabber dot markers. This post is sponsored by Fiddle and Doodle. In our home, we like to do open-ended art activities and simple learning activities that expose kids to basic preschool concepts without them even realizing that they are learning. 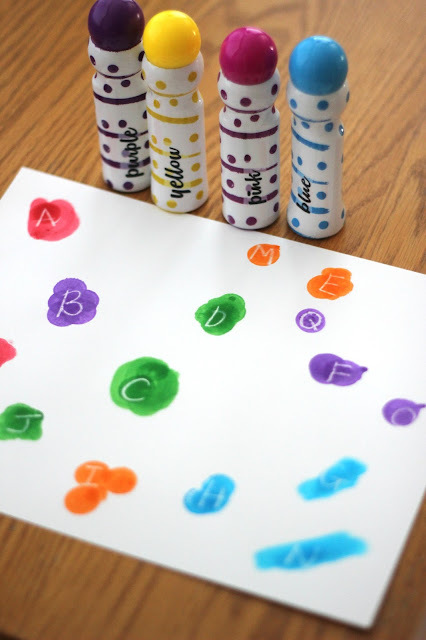 Using our Fiddle and Doodle dabber dot markers we've had fun learning about colors, alphabet letters, and our names. Scroll down to check out the four activities that we tried together. 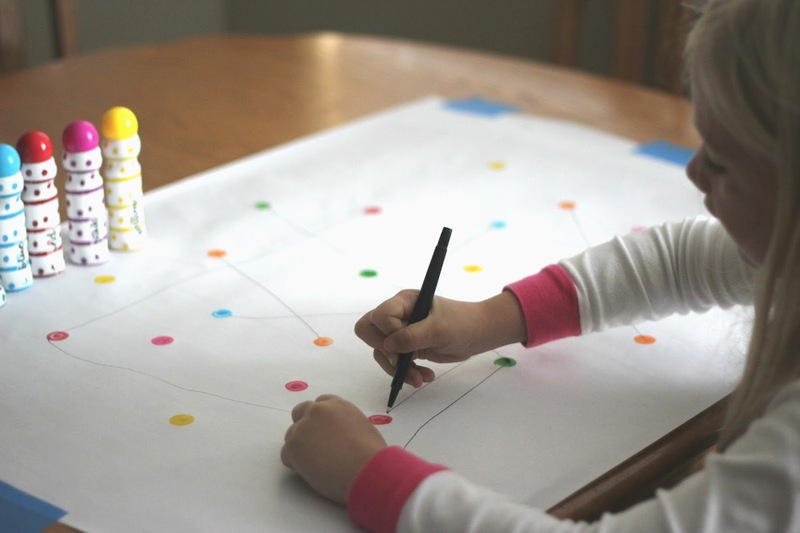 My kids love taking out their dabber dot markers and coloring all over paper. They especially love it when I put out large rolls of white paper and tape them to the table. 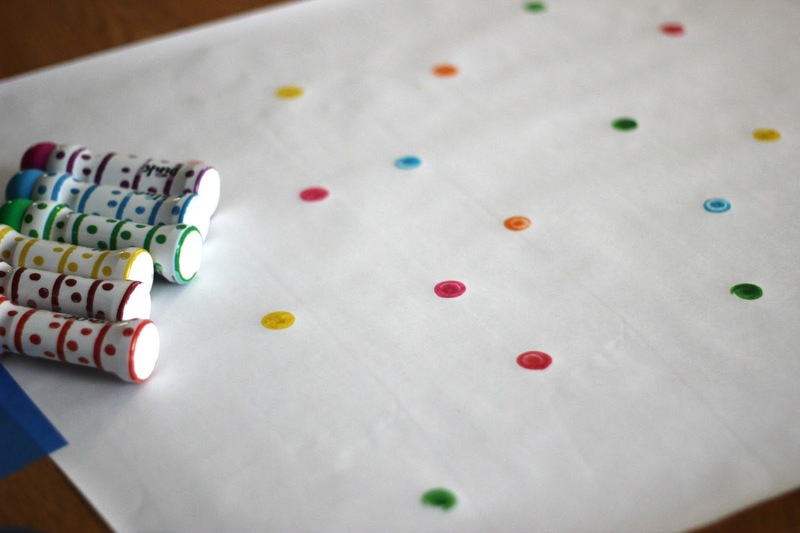 This week we rolled out some paper and I had my kids cover the paper with colorful dots. My only instructions were to spread out the dots a lot so that they covered the paper as much as possible. 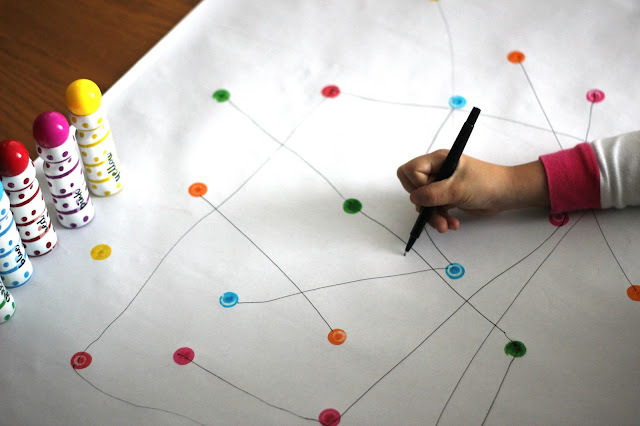 Once we covered the paper with colorful dots, I gave the kids a black marker and told them to connect the colors so that the yellows connected with the yellows, blues connected with the blues, etc! The kids loved talking about the colors and hunting for their matching colored buddies. This activity was so simple, but helped us work on color recognition and matching. We also worked on some simple fine motor skills as we tried to draw straight or curvy lines from one colored dot to another one. For this next activity, the kids were on a secret mission to find and name all of the alphabet letters on the super secret piece of paper that I gave them. To get started I wrote several alphabet letters on a white piece of paper using a white crayon. It was really tricky to see the alphabet letters that I wrote. Then, I handed the kids some dabber dot markers. They had to hunt for white crayon, dab the crayon with their marker, and decipher which letter I had written. My daughter thought it was so fun to be an alphabet detective! While we identified the letters we also talked about words that started with each alphabet letter. For older kids you could hide words instead of alphabet letters. 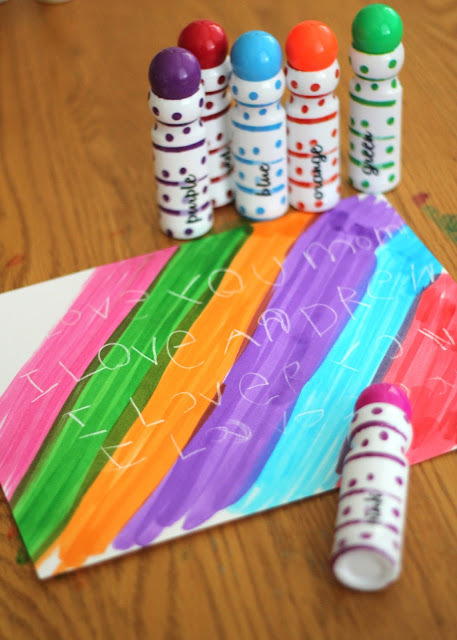 As kids are learning to write, it is fun to teach them about letter writing and drawing notes for people that they love. My kids love writing secret messages and leaving them under my pillow. Sometimes I can't even read what they have written, because their notes are a mix of scribbles and letters, but that doesn't matter. Teaching kids to write involves them learning to make their mark on all sorts of surfaces before they are even exposed to the alphabet. 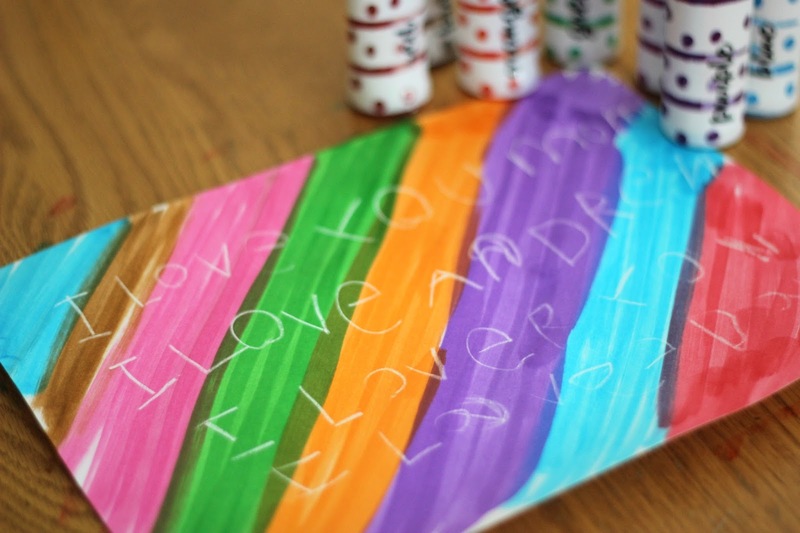 For this activity, we each wrote a note with white crayon on a piece of white cardstock. My daughter had me help her with some of the letters and my son just dictated his message to me. Next, we used the Fiddle and Doodle dabber dot markers to color on top of the white crayon to decode the secret messages. Once we were done, we read the letters to each other. My daughter was so proud of her writing! I loved how vibrant the markers were as I used them to decipher the message! The Fiddle and Doodle dabber dot markers are really durable and hold up well with a lot of coloring. The tops don't rip or tear when kids push on them hard and we didn't notice any leaks either! My kids are not very gentle with markers and I was pleasantly surprised that our new dabber dot markers were still intact when we were done! We covered the table with markers and they were washable and didn't leave a stain either! 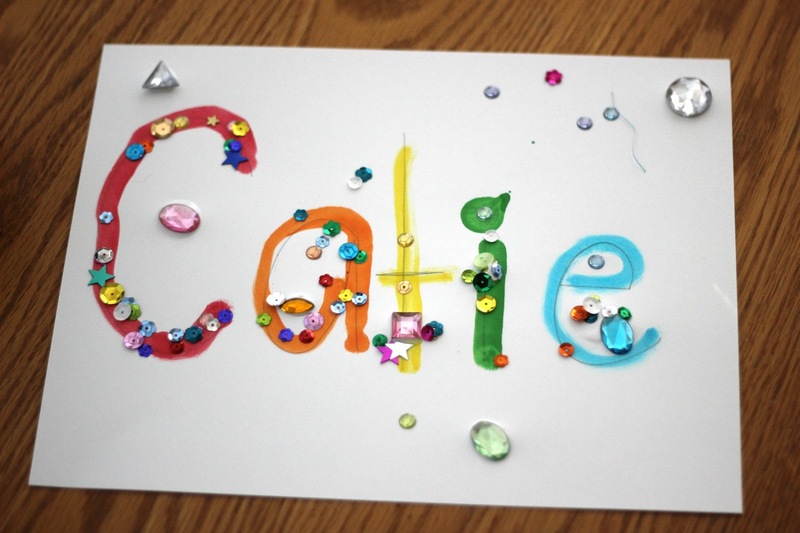 For our fourth activity we created some sparkly name art. We love name activities, especially simple ones. 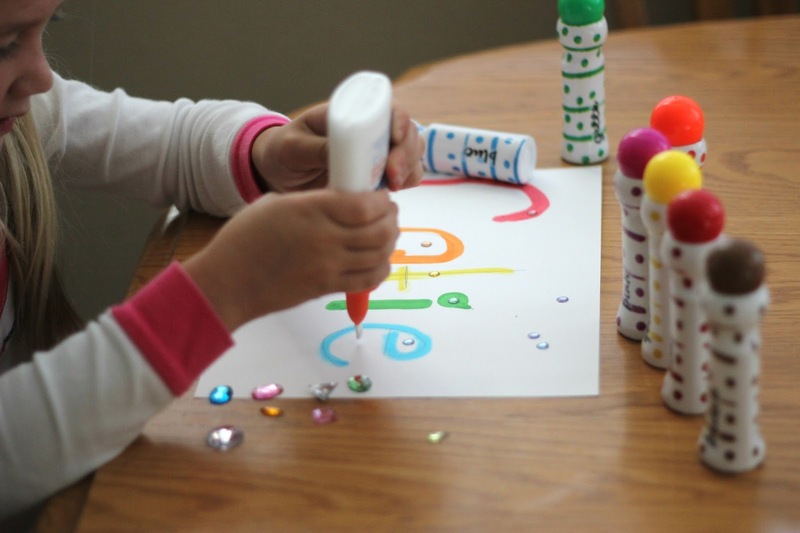 Materials Needed: white paper, dabber dot markers, sparkly embellishments, white glue, pencil. To get started we wrote my daughter's name with pencil on a piece of white paper. Next, she traced it with the dabber dot markers. After she traced it, she embellished her name with all sorts of jewels and sparkles that we had on hand. She especially loved using the giant jewels to decorate her name. 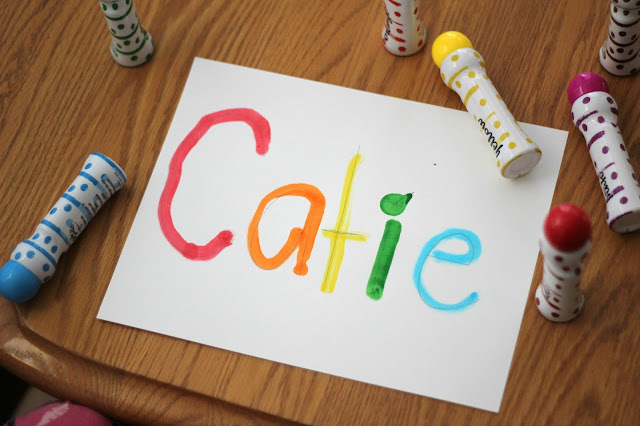 Tracing the letters of her name, exploring the letters, and decorating them was such a simple yet helpful learning activity. 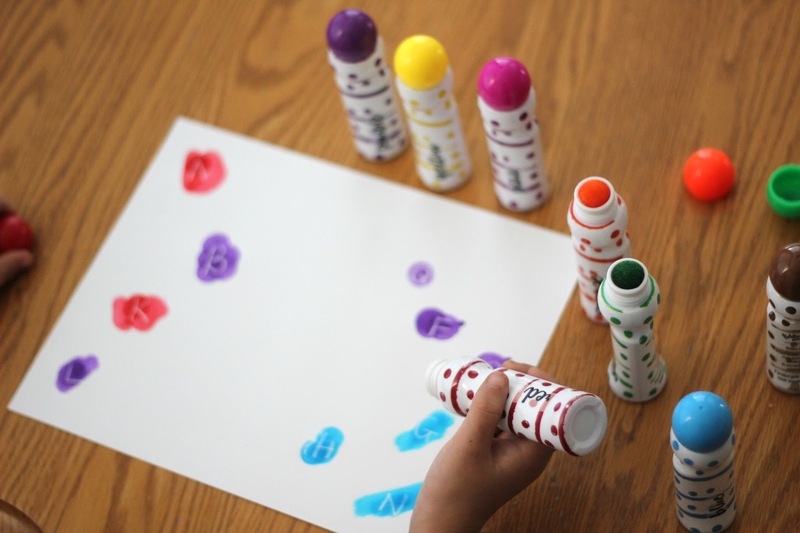 Carol Lyons has said, "The most powerful and effective way for children to begin learning the complex process of learning about letters is by writing their own names." I would also add that creating, exploring, and playing with the letters in their names can also be powerful. 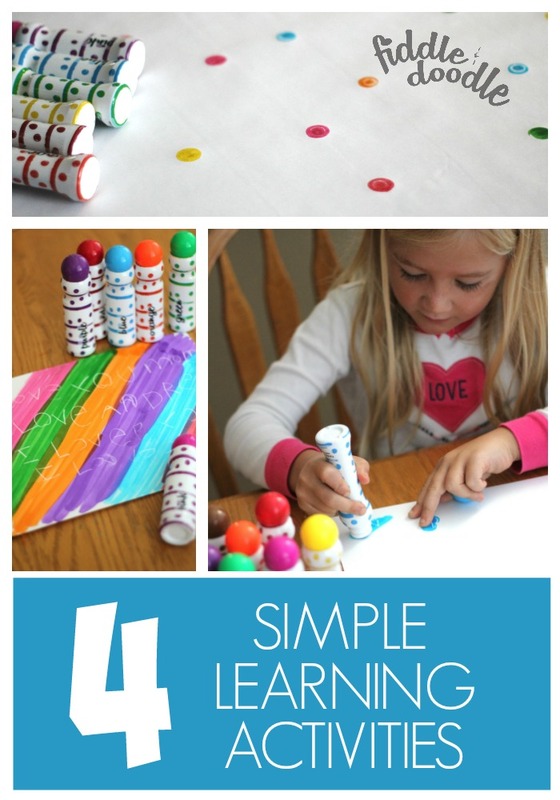 After we were done with these simple learning activities I showed my kids all of the paper plate activities that we love and they continued creating with their markers! 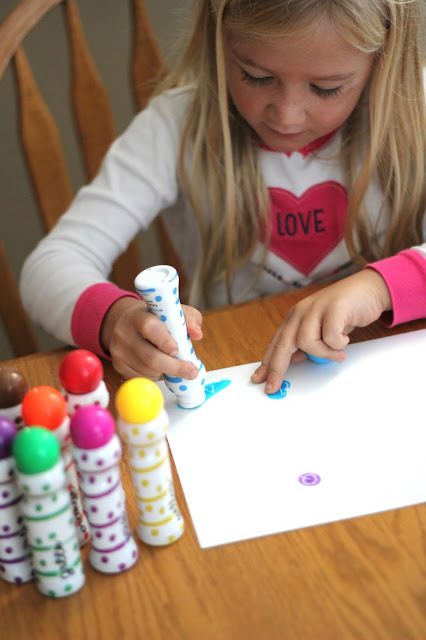 We loved the opportunity to try out these new-to-us dabber dot markers from Fiddle and Doodle. My daughter also loved that the markers came with a dabber dot activity book. We had fun creating alphabet letters and coloring in different pictures using the activity book. The activity book includes 30 removable pages. You can keep up with Fiddle & Doodle and all their news on new products, promotions, etc. by following them on their various social platforms. You can find them on Facebook, Pinterest, Twitter, and Instagram. Fiddle & Doodle is amazing and is even providing our Toddler Approved readers with a special discount. If you enter code TODDAB10 at checkout you can enjoy a 10% discount (expires Nov 2017). Buy Fiddle & Doodle Dabber Dot Markers HERE. These are going to be one of my "go to" gifts for friends with kids this Christmas. I have used other dot markers for YEARS and am constantly buying new ones because they don't hold up well. I am IN LOVE with these Fiddle & Doodle dabber dot markers and feel so privileged to have gotten to try them out and share them with you all! They are awesome! They come with eight bright markers. They have soft sponge tips and are in an easy to grip ergonomic shape. They have safe, quick dry, non-bleeding Ink and they won't stain clothes!! They are non-toxic and are designed for kids ages 3+. Go try them out! Do you have any other favorite activities that you could try with these dabber dot markers? Please tell me about them in the comments! This post is sponsored by Fiddle & Doodle. All opinions are mine.